If for some reason you don't want to see the images or my answers, don't open the page break. I don't think it spoils anything, but it's your eyeballs! They won't let you do this until you finish all your essential shopping, and then it's a quiz. I panicked a little, wondering "Should I answer what's true in MY reality, or in the reality I would write for myself?" This really only came up around Eye color... I usually write myself green eyes. It's not too much a stretch, my dad has green eyes. I decided to be honest and see what happened. After all, a wand would be a wand! -> Short (for my age, when I was in school); Dark brown eyes; Odd numbered birthday; Pride myself most on Imagination (though I thought hard about Resilience); (Shown paths to the Sea, Forest, or a Castle, I would walk) Ahead to the Forest; (I most fear) the Darkness; (Finding a trunk having a Dagger, Scroll, Mirror, Bottle, Glove, I would choose) the Bound Scroll. I'm very excited with my result! 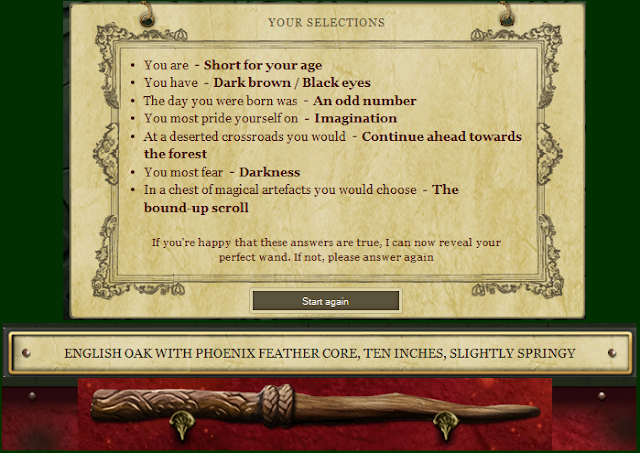 I was expecting Willow (since some of the wand-woods seem to be distributed according to your birthdate in the Celtic calender, but Hagrid's wand proves that sometimes character overrides horoscope) heh. I'm really excited about the Phoenix Feather! Not for the "Oh it's supposed to be rare" etc, but because I fancy that, after graduating from Hogwarts, I would be a Professor of the Care of Magical Creatures, specializing in winged beasts! Therefore, having the feather of a winged beast in my wand tickles me pink. I was really worried about the Sorting Hat. There are bunches of people who, as I read in another blog, identified with a certain house for a decade now and ended up somewhere else. A stat breakdown (where did I put that blog) showed all the houses have an even population within 0.1%, which some take to infer that the Sorting Hat may be less based on your choices and more based on an even distribution of students. There were really no "Here's what I answered and what I got" out there, so I want to post mine, but I DO believe that the answers may only be half the equation, with the other half being randomness et even distributing. I wanted Ravenclaw, but before I started I told myself that no matter where it put me, I would still be a Ravenclaw according to Canon, and me. Maaaaybe I picked Wisdom because it was green, brown, and had a leaf on it, or maaaybe it's because the other potions were stupid. Okay, both. Also, the other garden items were a winking statue, a swirling pool, and something else forgettable to me. Talking fungi would be keeeen. This was really hard for me. A cure, 1000 years of history, and a Book of Merlin. Here's how I broke it down: though the Cure is the most immediately important, I can't imagine ANY scientist (or potions master) working on a potion/solution and NOT having detailed notes of what went into it. Therefore "irreplaceable" it's really not, except if the ingredients are one-of-a-kind rare. Weighted against the Book of Merlin, which is completely irreplaceable (assuming there are no copies scribed anywhere, we assume it's unique), which could hold the cure to HUNDREDS of poxes. Most important. A 1000 years of history would be a terrible thing to lose, but it's life-or-death important. 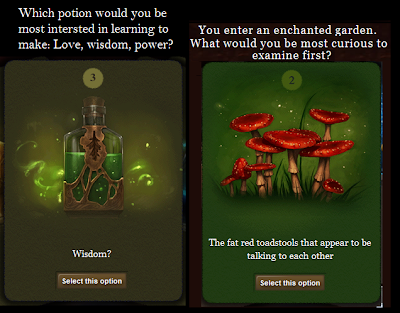 I still rank it above the potion that I believe has a repeatable recipe if not ingredients. What I'm most looking forward to learning at Hogwarts? This was a little hard for me. First I saw Transmutation, which growing up I always knew would be the one power I wanted if I could have one. It also ended up my favorite spell in Dungeon Siege, even when everyone else usually ditched it. THEN, all about magical creatures! 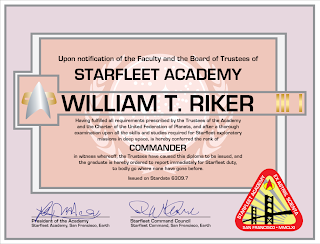 Since I would want to "teach" this after graduation, this was a HUGE temptation. Then of course I saw "Every area of magic I can" and what better for the girl who wants everything, than everything? I wasn't named "Bouncing Raven" for nothing! Some slightly random ones. If I heard a magical cry late at night, I had a hard time deciding to either proceed with caution with hand on concealed wand, or stand back into the shadows and wait to see what happened while going over my best defensive/offensive spells should I need them. After great deliberation I decided a moving target was better than a sitting duck. Forest or River, forest obviously. Left or Right (I hear it in the voice of the doorkeepers in Labyrinth), I chose Right: We go East, always to the East, and if I'm staring at the compass rose the East is to the Right. Meh. Oh my sweet bangarang gibbledeebits I'm a RAVENCLAW! SQUEEEEEEEEEEE!!!!!!!! Yep. happy. I can now break and do real schoolwork lol. After spending over an hour (two?) playing and quizzing, then more than that prepping the images (stupid Paint, don't have PS on my laptop). Oi. Worth it though. Now I haz pretty picture FOREVERRRRRRSSSSSZZZZZZ!! !1.